The new Bluewaters Island in Dubai is an island style urban living lifestyle situated just off the coast of Jumeirah Beach Residence. It offers those seeking a new life in the city, with its exclusive selection of 698 one, two, three and four-bedroom, glass-fronted apartments, 17 townhouses, and 4 penthouses, along with stunning, clear views of Dubai’s spectacular coastline and skyline. On that note, here are five compelling reasons why you should consider moving to Bluewaters Residences. Bluewaters by Meraas is a family-oriented island that is bound to create an unimaginable experience for all. It is located within a world-class destination with a pioneering spirit that blends island, waterfront living with the beauty of the city. 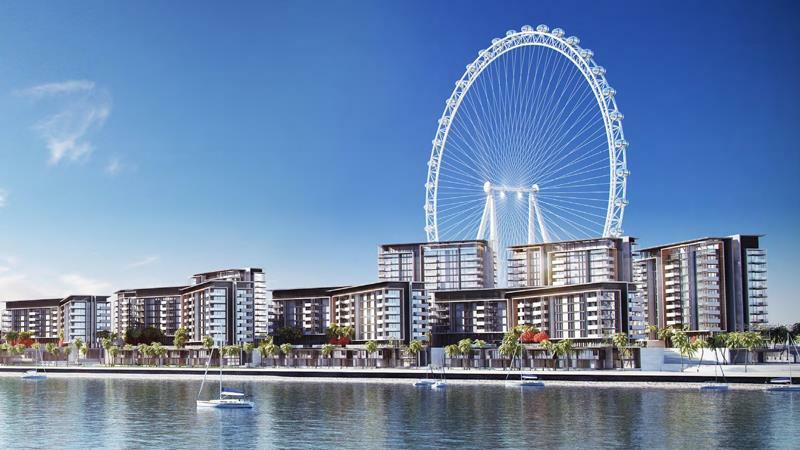 It is set to become one of the world’s largest tourism hotspots, having the world’s largest observation wheel and a diverse range of distinctive residential, hospitality, retail and entertainment concepts. Residents’ can wake up to Dubai’s newest iconic landmark, Ain Dubai, the world’s largest Ferris wheel that is a staggering height of 210m. Residents living in Bluewaters apartments, as well as tourists, will experience unforgettable views of the city’s incredible landmarks and the Arabian Gulf, truly give them the best of the best. Apart from the unrivaled views of Ain Dubai, residents can also benefit from the connectivity and close proximity to the city’s popular key destinations. It’s within touching distance of Dubai Marina and there’s a direct road link from Sheikh Zayed Road. Another exciting feature is that Bluewaters will operate the Group Rapid Transit service, which offers residents and passengers an exceptional travel experience via a driverless vehicle system. It’s strategically situated to take you at ease to the most visited areas. It’s 45 min to Abu Dhabi airport, 30 min to Dubai International Airport and Al Maktoum Airport, 20 min to Downtown Dubai, and 7 min to Dubai Marina. Whether it’s entertainment, relaxing, shopping and dining, you’ll be spoilt for choices.There are 164 retail, dining and entertainment outlets available for tourists and visitors in the vibrant lifestyle destination. They can indulging in an array of global cuisines and visit hundreds of retail stores, ranging from homegrown brands to international fashion, and souvenir stores for all ages. Located on the tip of the island, there are two, five-star, luxury hotels at Bluewaters that are designed for those seeking a seafront retreat. Along with its epic dining and awe-inspiring entertainment, the hotels are set are set to attract millions of discerning guests and visitors from the UAE and abroad. Designed for a contemporary lifestyle, Bluewaters residences can feel at home while having the highest standards with its neutral palette and a minimalist style. It also features floor to ceiling windows, allowing residents to soak the beauty of Ain Dubai, the sea, the greenery, a boulevard and crystal blue Arabian Gulf. Additionally, there are state-of-the-art residential amenities that everyone seeks such as landscaped gardens, gymnasiums, swimming pools, basketball courts and children’s play areas. Bluewaters is a place to unwind in style and truly provides a unique island experience. The island showcases Dubai’s most exciting new attractions such as Ain Dubai and Caesars Palace. Whether you’re visiting for the day or living in Bluewater Residences, it will truly give you the ultimate, world-class lifestyle. Have You Ever Visited Dubai Via Dhow Cruise?